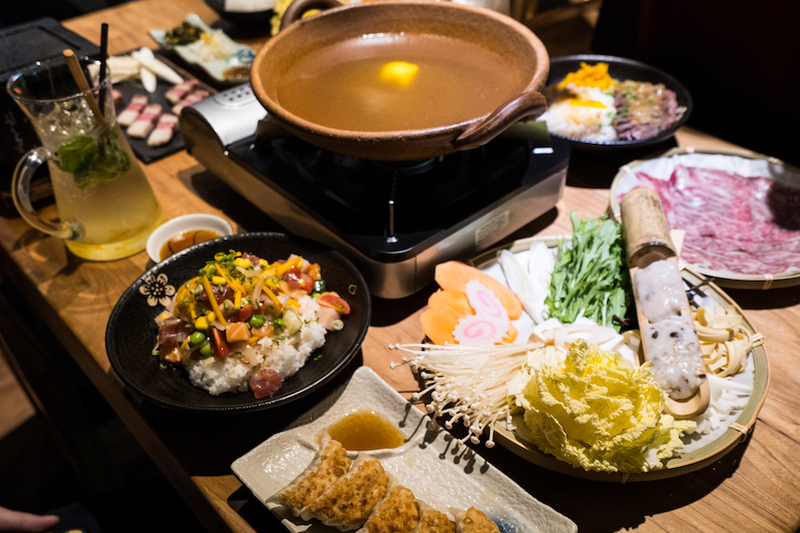 A restaurant serving up an entire menu (almost) full of Yuzu items: Yuzu Shabu Shabu, Chirashi Kaisen Don with Yuzu, Yuzu Gyoza and even Peppery Yuzu Ice Cream. Yuzutei, 柚子亭 which means Yuzu Pavilion in Japanese, offers a yuzu-centric menu which would attract yuzu fans. 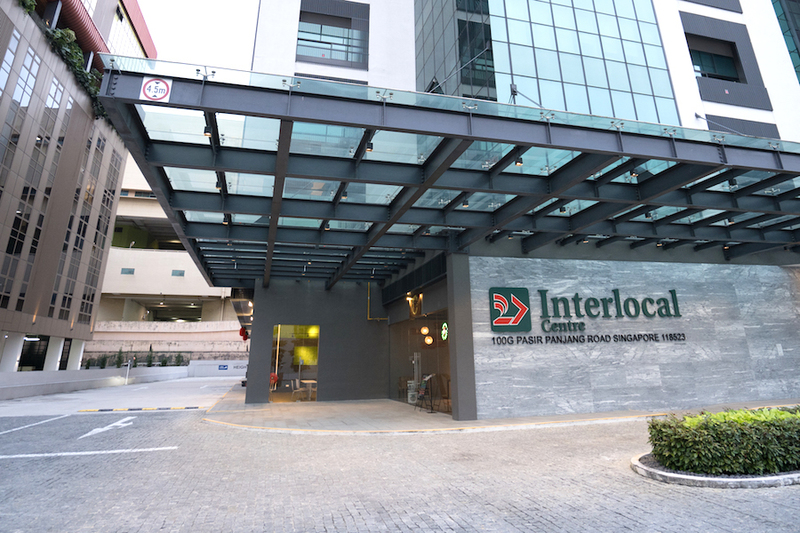 It is located at level 1 of the Interlocal Centre – a development in the heart of the rejuvenated Alexandra Pasir Panjang region, and of approximately 8 minutes’ walk from the nearest Pasir Panjang MRT station. The Hort Park is a two-minutes’ walk away. 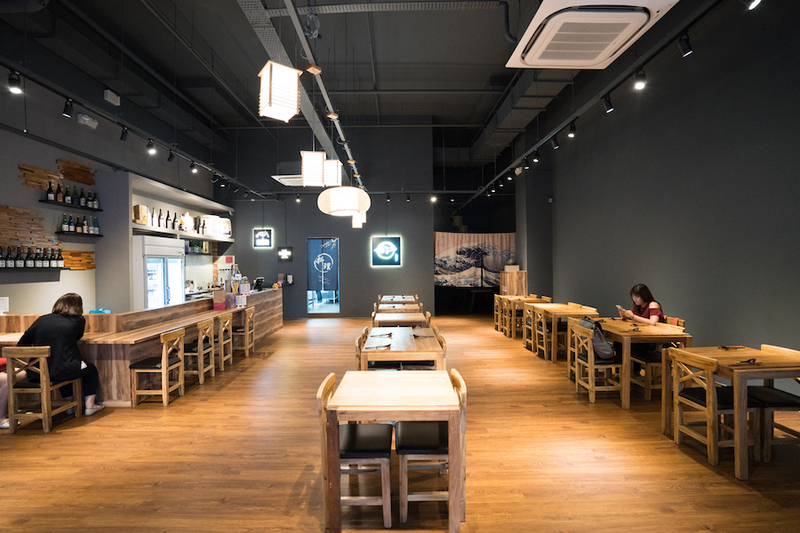 The spacious 40-seater restaurant is decked in woody elements like most Japanese restaurants, with tall ceiling and warm lightings for cosy dining and gathering. 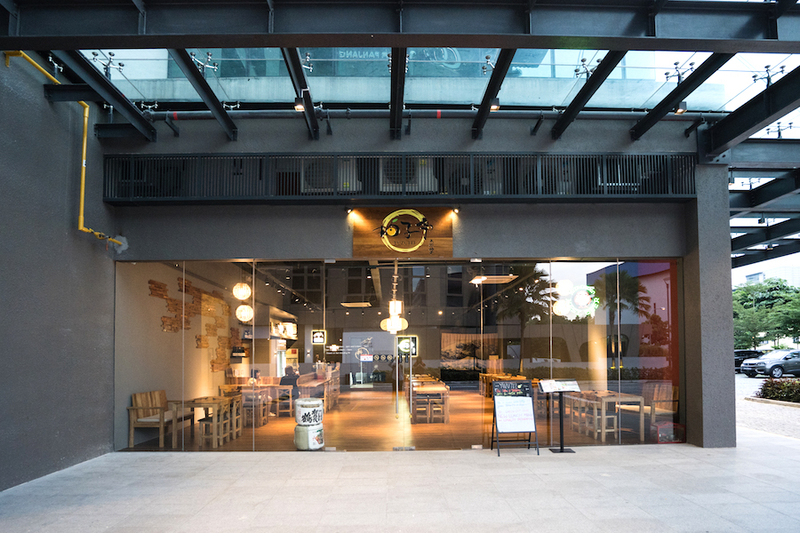 The owners decided to have a Yuzu-specialty restaurant due to its unique taste, health and beautifying properties. Plus there are no other restaurants like this in Singapore. Widely known for its multiple properties such as richness in Vitamin C, antioxidants, anti-inflammatory and boost in immune system, Yuzu has become increasingly popular in the recent years, especially in Japanese cuisines. The Japanese citrus fruit tastes like a combination of lime and grapefruit with a distinctive sourness initially and slight bitterness in the aftertaste. 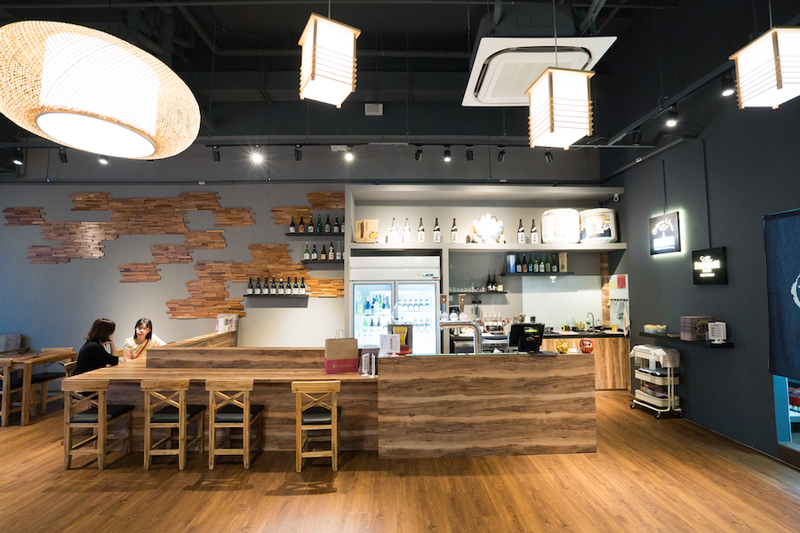 Some eateries in Singapore use another form of yuzu, such as yuzu jam or essence for flavours in their food, but Yuzutei actually imports “Kito Yuzu” from Japan. The “Kito Yuzu” is the highest grade of yuzu, and are grown and harvested in Tokushima Prefecture, Japan, stored using technology to ensure consistent quality all year round and air-flown to Yuzutei. Sugoii desu! Look at the beautiful marbling which resembled of a snowflake. 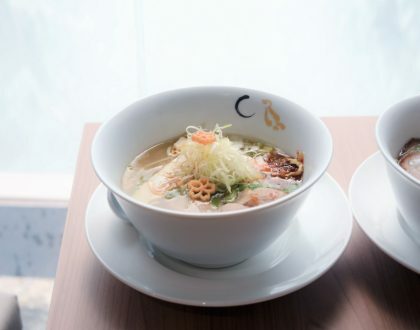 The Signature Yuzu Soup uses a chicken soup base simmered for 6 hours, cooked daily with fresh Yuzu fruits, with Yuzu juices added into to bring out the light and refreshing taste in every components of the Shabu set. Well-complemented with the yuzu soup base, the A5 Hokkaido Snow Wagyu was soft and tender. The light citrus-ness of the soup base also allowed one to appreciate the meat in its natural flavours. If you are looking for additional flavours, 2 dipping sauces are provided: Ponzu (sour) and Yuzutei Special – Yuzu, Radish, Chili (spicy). 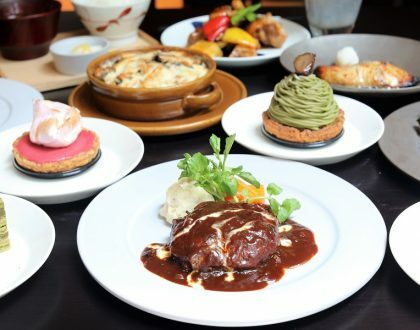 If you are not a beef lover, Shirobuta Pork ($26/pax) or Seafood ($32.50/pax) are available. 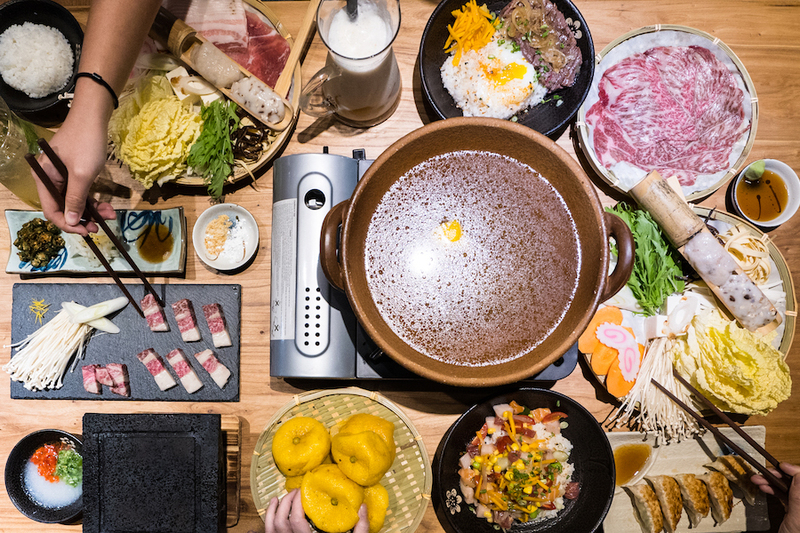 Each Shabu Set comes with a Signature Yuzu Soup Base, Handmade Prawn & Shiitake Mushroom Paste, Japan Mizuna Vegetables, Assorted Vegetables, Tofu, Japanese Fish Cake and Rice. 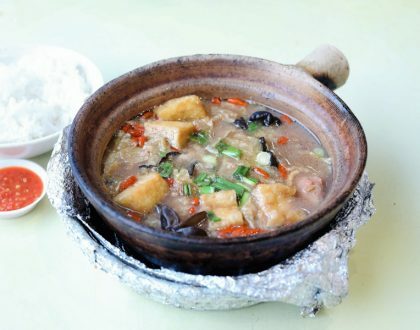 The highlights are the Homemade Prawn Paste and Shitake Mushroom Paste which are soft, fragrant and flavourful that would make you go “oishii”! 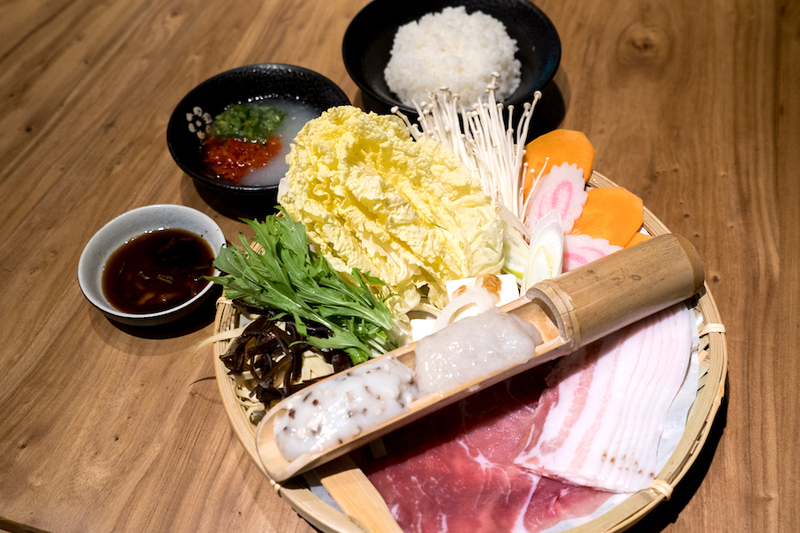 The Shirobuta Pork comprised of both pork collar and pork belly, and are sourced directly from Kyushu in Japan, with the right amount of fattiness. If you require a more substantial meal, add-ons such as 100g Hokkaido Snow Beef ($35), 100g A4 Japan Wagyu ($35), Homemade Prawn Paste ($7) and Shitake Mushroom Paste ($4) are available. 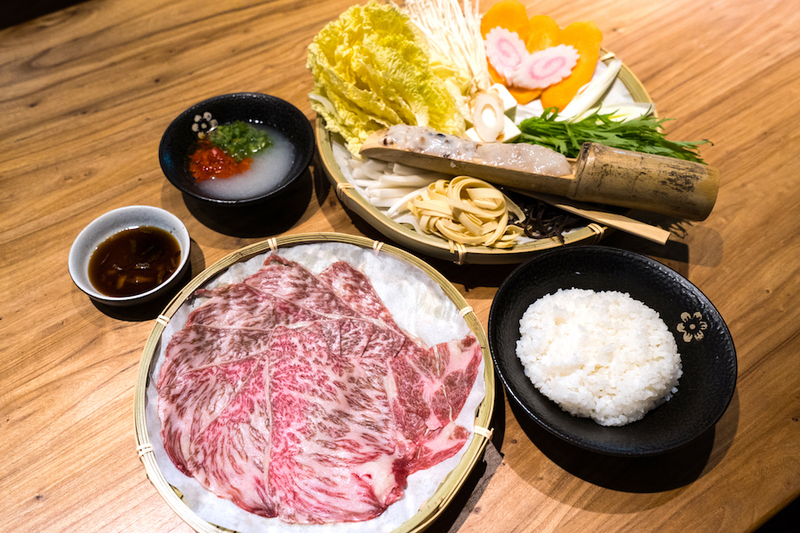 Apart from Shabu Shabu, the sizzling Hot Stone Grill comes with options such as A5 Hokkaido Snow Wagyu Zabuton Jo-Rosu cut aka Chuck roll (100g $45, 150g $63) or A4 Japan Wagyu Steak Cut (100g $45, 150g $63), Bluefin Tuna Belly (100g $43). 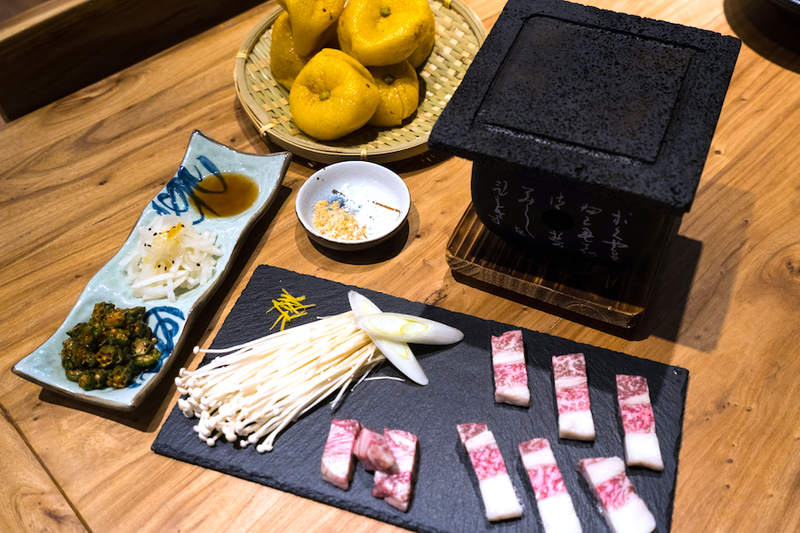 Each Hot Stone Grill set is served with Yuzu Daikon, Spicy Okra (Lady Fingers) and Signature Yuzu Salt Dips. The Spicy Okra was quite unique on its own, with a crispy and crunchy texture that reminded me of lady finger chips. As for the meat, the Zabuton Jo-Rosu cut was slightly on the fatty side on the day of visit, which requires more effort in chewing. If you are thinking of head during lunch, more casual Japanese food items of Classic Donburi such as Salmon Mentai Don ($14), Chirashi Kaisen Don ($14.90), Unagi Don ($16), Teriyaki Chicken Don ($10); and Yuzu & Mentai Pasta are available. 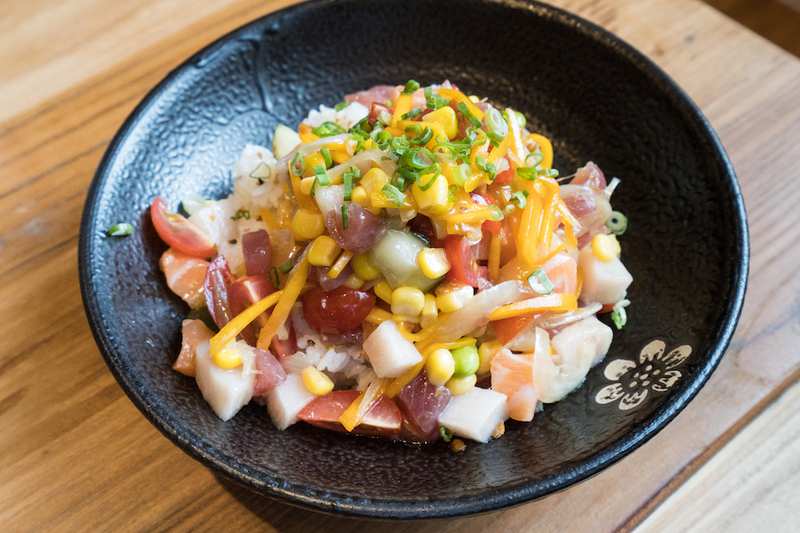 The Chirashi Kaisen Don ($14.90) comes with an assortment of diced sashimi such as salmon, tuna and swordfish belly marinated with homemade vinaigrette dressing. Something unique is the addition of tomatoes, corns, edamame, pumpkin slices, spring onions on top of fluffy, white Japanese rice with a light, citrusy and refreshing dressing, adding texture and flavours as a whole. 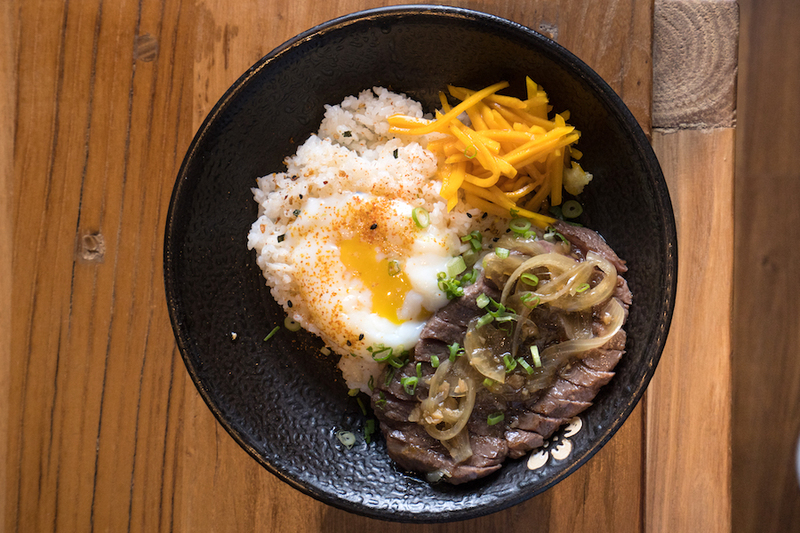 Another recommendation is the Garlic Vinaigrette Gyu Don ($16) which comes with Vinaigrette Pumpkin slices which made the combination less “jelak” (rich). The beef slices were thin and has a tender, soft texture, while the citrusy touch added a refreshing take. 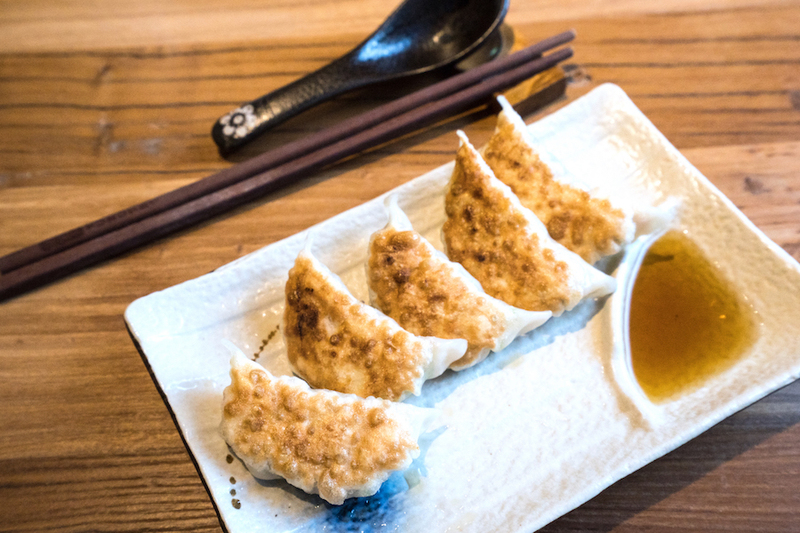 With limited portion a day, the Yuzu Gyoza are handmade by the chef daily before pan-frying, resulting in a crispy, golden brown appearance. Dip into the ponzu sauce, a citrus-based sauce made using rice wine, rice vinegar, bonito fish flakes, seaweed and yuzu, for additional flavours. “Nan desu ka”? 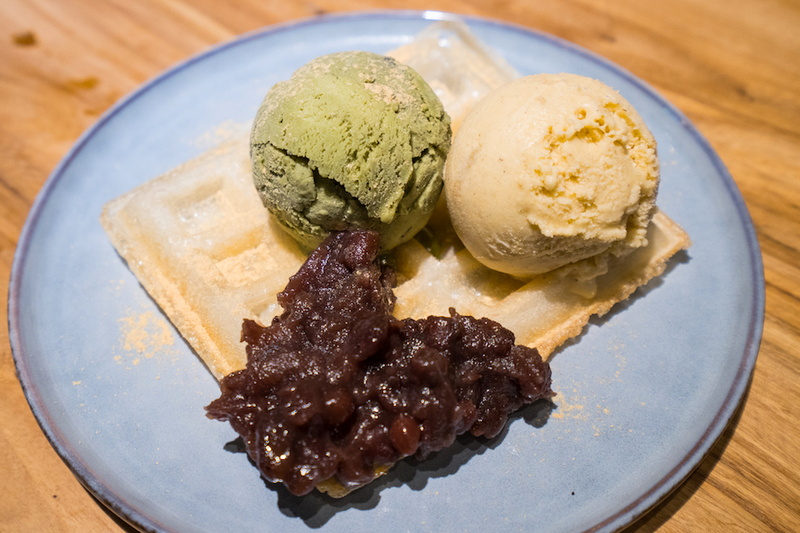 Moffle is the combination of both mochi and waffle, with a crispy edges and chewy texture. Priced at $2 for the Moffle with Classic ice cream flavours (Single $2.50/ Double $4) such as Vanilla, Chocolate and Cookies & Cream, and Premium ice cream flavours (Single $3.50/ Double $6) such as Matcha Black Sesame and Peppery Kinoko Yuzu. The Matcha Black Sesame has a strong, earthly and robust taste whereas the Peppery Kinoko Yuzu was pleasantly spicy and refreshing at the same time. Shaped just like an upsized agar jelly and known as Japanese Raindrop Cake, this dessert took the internet by storm in 2016 and is constructed mainly using water as the name implies – mizu. 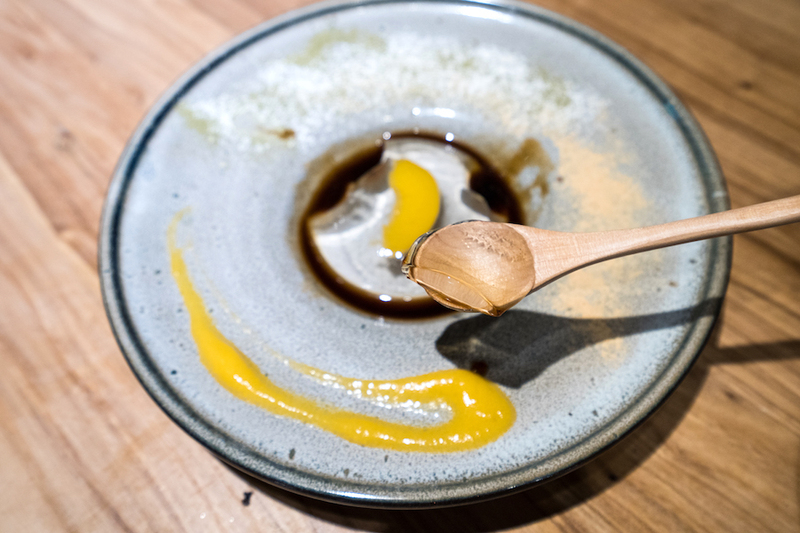 Take a scoop of the Mizu Shingen Mochi and some Kinako Powder (roasted Japanese Soy bean), Kuromitsu syrup (Japanese sugar syrup), Peach Puree or Matcha powder served by its side to enjoy 4 different flavours. My favourite was the matcha powder with kuromitsu syrup, which gives a combination of sweetness and bitterness. 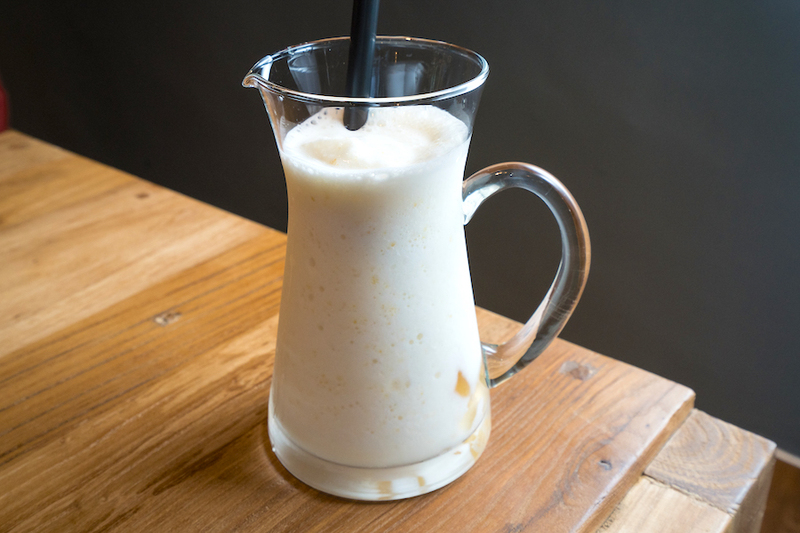 Ice blended using Kito Yuzu, the Yuzu Smoothie is both refreshing and distinctive in yuzu taste. Unlike other smoothie, the yuzu added was light, fruity and not too filling. I enjoyed the homemade jelly added into the smoothie which gives it additional textures. For a lighter drink, the Yuzu Soda is available for extra fizzy sensation. While it is still starting days for Yuzutei, they managed to have unique offerings with a yuzu-centric menu. I do think they can afford to expand their menu for even more interesting selection, especially in the dessert component. 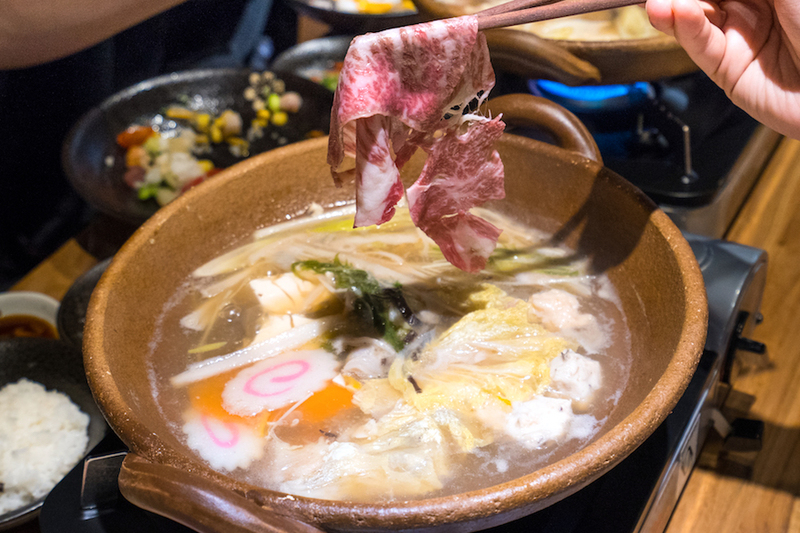 The shabu shabu soup base, added with yuzu specially air flown from Tokushima Perfecture Japan, makes it a worthy visit. * Written by Nicholas Tan @stormscape. This entry is brought to you in partnership with Yuzutei. God, such a long time i dont enjoy Japanese food. I will come this restaurant for sure!